Hi. Let’s talk about pregnancy. It’s been a while, hasn’t it? Honestly, I imagined myself writing more about my pregnancy as it progressed, but I came to the conclusion that nobody actually wants to hear it. You might THINK you want to hear about the details of someone else’s pregnancy, but unless you’re another pregnant woman looking for validation of her own craziness/weird symptoms/aches and pains/lumps and bumps, you probably don’t actually want to know. As it turns out, the quotidian experience of pregnancy is, in a nutshell, a collection of gross symptoms not fit for social media punctuated by occasional dashes of the sublime. So, perhaps not the best blog material (unless all of your readers are hormonal preggos, or, alternatively, my mother and/or my husband, both of whom are contractually obligated to be interested in the nitty gritty of this process). This isn’t to say that pregnancy isn’t awe-inspiring and beautiful and fantastic, but rather that if I were to report on it frequently, it wouldn’t sound particularly awe-inspiring, beautiful, or fantastic. It would probably just sound boring and gross. So I haven’t really been writing about it, except in my private pregnancy journal, which I’m pretty sure is making me sound way more neurotic than I actually am. In fact, I might burn it after the baby’s born to hide the evidence of my crazy. But then how will I remember that one epic crying jag I had, or the two separate times I fell on my knee and convinced myself I had given the baby brain damage in the process? These are precious moments worth cherishing! But, seeing as I’m coming up on 30 weeks pregnant now, I thought it was time for a bit of an update on what’s going on, uterus-wise. So here we go! Now that I’m in my third trimester, I feel like I have a pretty good handle on what pregnancy is all about, although new symptoms are always popping up to surprise me. For example: my ears hurt now if I lie on them for too long (thanks, increased blood volume! ), and I always end up lying on them because I’m not supposed to lie on my back to sleep any more (thanks, increasingly large baby and inconveniently placed major blood vessel)! Also, I’m constantly blowing my nose. Oh, and don’t get me started on the heartburn. And the other stuff. There’s lots of other stuff. You know, let’s not even go down this road, because if you ask a pregnant woman what her symptoms are, you’re going to find out stuff you never wanted to know, and there’s no un-hearing it. Anyway, the cool thing about being this far along is that the baby is super active, so I feel like we’re communing during the day when she’s kicking the crap out of me. It shows how much I love this little fetus that I don’t even mind when she’s sending judo chops straight to my groin. I find it endearing! (“Aw, baby has a great right hook!”) She moves a lot, and whenever Al’s around, I’ll put his hand on my abdomen so he can feel it, but of course, as soon as he has his hand there, she stops moving. He’s gotten to feel a few good kicks, but I wish he could feel what it feels like from the inside. It’s weird and wonderful! Now that we’re a mere eleven weeks away from meeting this kid (give or take a few weeks on either end, probably), we’ve been trying to get things ready for her around the house. So far, we have the crib set up, and the nursery is filling out — we’re just missing a changing table, but that’s what bathroom counters are for, am I right? — and mentally, I think we’re as prepared as we can be. Like most delusional, first-time, soon-to-be parents, we just want the baby to get here, already, although literally every parent I’ve ever talked to has stressed that we should be savoring these last months together as a Childless Couple. So, we’re doing our best to savor, I guess, but really, we both are super excited to get to know the much-anticipated third member of our family. Right now, all we know about her is that she likes to kick things, and all she knows about us are the muffled voices she hears through her water-balloon apartment, so there’s a lot to learn on both sides. So, overall things are going well. I’ve enjoyed pregnancy, so far — not all of it, of course, but most of it. Hopefully, parenting will be even better. At least no one will be kicking me in the groin then. 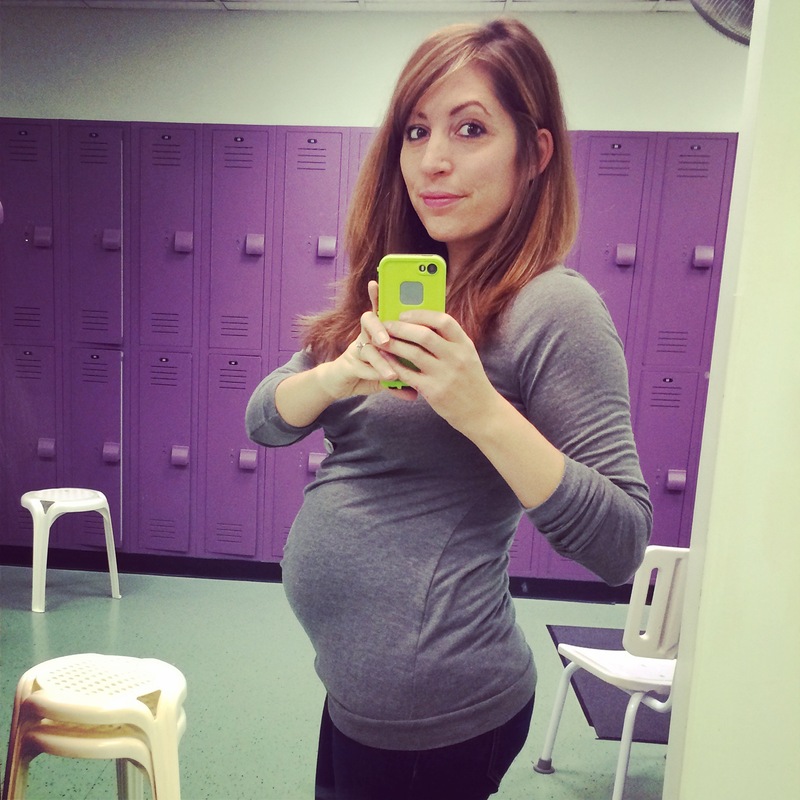 This entry was posted in Pregnancy and tagged pregnancy on November 20, 2014 by Stephanie.